Any Multiplayer focused game will only be as good as the team you sign up with or the monster you play against. Evolve is a case in point. 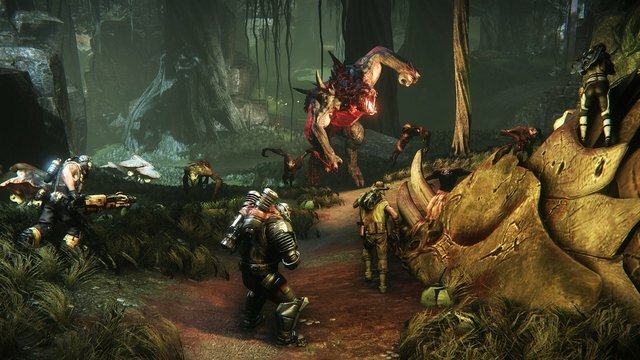 Evolve is a game of four on one, the four in question are hunters, each with their own class; Medic, Trapper, Support and Assault. The one is the monster, chosen from a range of fearsome creatures that tower way above the hunters and have access to some powerful attack moves. Just as with EA’s Titanfall, Evolve lives or dies by the working of your team and the communication (or lack thereof) with them. The game does its best, though, to help gel a team together and point them in the right direction. Fortunately, for a game that requires you to play as one of the four types of hunter, each is just as important as the other and one of Evolve’s strongest elements is the balancing of these classes to make each one unique but also indispensable. It’s possible to win matches with just two hunters left but far harder than with everyone working together. The Medic, often the weakest character in the game, is vitally important to keeping the team alive in the midst of a monster attack. The different characters within this class have the ability to either revive dead team-mates (or other survivors in some modes) while cloaked or shoot a healing blast from a distance and tranquilise the monster with darts. Likewise, each of the other classes are further split into different characters with differing abilities. There’s plenty of choice to suit fussy gamers here. But it’s not just about choosing something that gels best, the game’s balancing act forces you to think carefully about the whole of your team. Where a strong but slow Assault character works well with a faster Support and long range Medic, the dynamics are changed completely if the person charged with playing as Assault changes their mind and chooses a completely different selection. This is the first indication that communicating with team mates from the off is essential and while playing with friends isn’t always possible, it’s best try to spark some banter early on, even with strangers. Likewise, the Monster isn’t quite as straightforward as a choice of skin or being plonked down on the game world to do some damage. The different monster types all have their own set of powers and every one of the monsters starts off with weak armour. The clue is in the title of the game, the player who takes on the mantle of the monster needs to find food as fast as possible, usually in the form of the game’s wildlife, and evolve into something much more powerful before turning the tables on the hunting team. At the third stage of evolution the player is given a choice; either hunt down and kill the whole team or destroy the generators. Either option completes the game in the monster’s favour and both come with a risk, though it’s lessened by the evolved state being pretty damn powerful. Despite the game’s balancing system working well to ensure an interesting fight, there are some elements that can let Evolve down. For one, the first half of each game on the standard Hunt mode is usually a trudge through the forests to track down the monster, using clues such as disturbed flocks of birds or tracks that glow. It can turn into a slow trudge if the monster player is good at their job. Likewise, the monster has to feed and stay out of harm’s way if the player wants to survive for very long. If all goes right, though, the culminating battles can be beautiful. Assuming everyone works together there’s a great sense of triumph in killing the monster. This is even more pronounced in Evolve’s unique Evacuation mode. Taking place over five matches of differing types, players vote for a type and area of the map, from the Defend mode, where the hunters will need to stop the monster and some minions from destroying generators, to Rescue, where the Medic with the power to revive dead survivors is essential, and Nest, where eggs need to be destroyed by the hunters or hatched by the monster. This change of modes mixes gameplay up nicely and adds yet another tactic to the game in that the winners will determine a particular perk in the next level by completing something in the last. Stop the monster destroying a generator in your last game and the hunters will have the benefit of turrets protecting them in the next, or manage to hatch eggs as the monster and the minions will be there to help you on the next map. There are plenty of different scenarios and outcomes which can often surprise and delight players who complete these objectives. 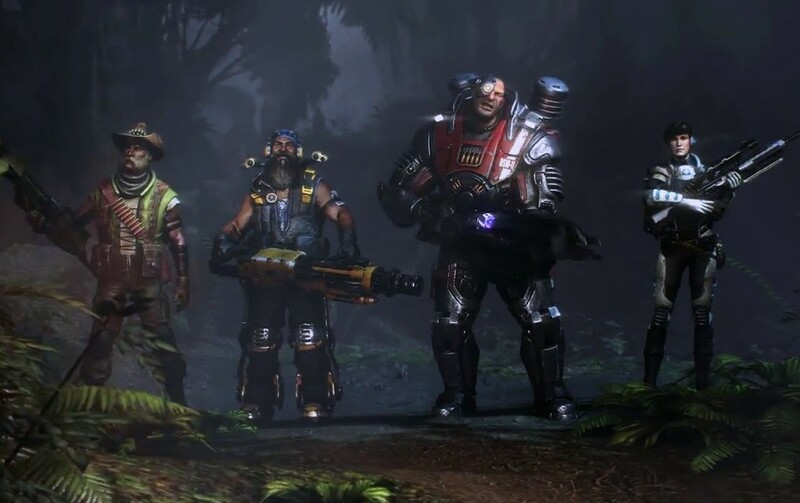 With friends or a good team of online players, then, Evolve is a great take on the team-based online game and the Evacuation mode adds a new twist to the multi-level game idea. Yet, it still comes down to how well a team works together and how much camaraderie can be found in each online game. Find the right team and Evolve can be great, play in silence and it can feel like a slog.